I bet you're wondering what the title's all about - The Same But Different. Today it's about the Same Layout Different projects and stamps. 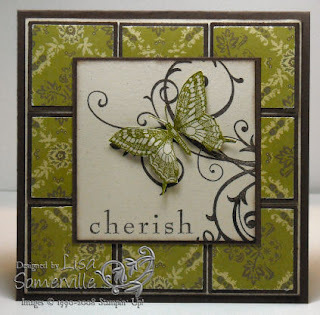 Sketch Challenge 182 reminded me of this picture frame I created last year. 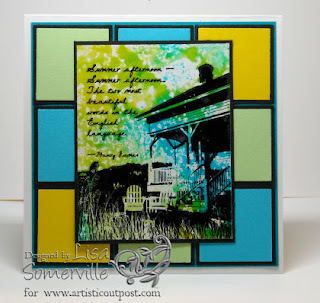 Now for a totally different look using the same sketch - I grabbed my bold brights and the new Keeper Plate from Artistic Outpost. Pretty funky colors, huh! The background technique is Reinker Splash from a past TJNL issue. This one with the butterfly stopped me in my blogging tracks -- really really beautiful! Such beautiful cards! The butterfly one is amazing!